The Bridgestone brand is known throughout the world thanks to its links with Formula 1 motorsport. Its mission is to provide customers with world class products and services. There's a reason that one in five vehicles globally are driven on Bridgestone tyres. Founded in 1931, Bridgestone now manufactures tyres for almost every type of vehicle, from cars and SUVs to buses, tractors and even aeroplanes. Renowned for their performance tyres that deliver on both safety and efficiency, Bridgestone is also the approved Original Equipment supplier for a number of leading car manufacturers, including Mercedes, Porsche and Volvo. The Bridgestone Dueler H/P Sport has been designed as an all round performer incorporating maximum traction off road and cruising comfort on it. Reliable handling in all conditions. Run Flat Technology sizes available where applicable. Asymmetric tread design for superb grip on larger rim sizes. NEW PATTERN. The Bridgestone EP150 has been developed for the Ecopia range designed to be ecology friendly. This Bridgestone tyre has lower carbon emissions, improved mileage & a more efficient ride which when combined with a low rolling resistance makes it very fuel efficient. The Bridgestone R410 is part of the Duravis range. Designed for small and car derived vans. High durability, high mileage and good performance in the wet. The Bridgestone ER300 is part of the Turanza range which is made for touring. Has smooth, quiet & economical performance. Run Flat technology sizes available where applicable. Premium wet handling. The Bridgestone Turanza T001 Evo combines high levels of safety, comfort and efficiency, to deliver a superior quality tyre. Enjoy the ride, whatever the weather. 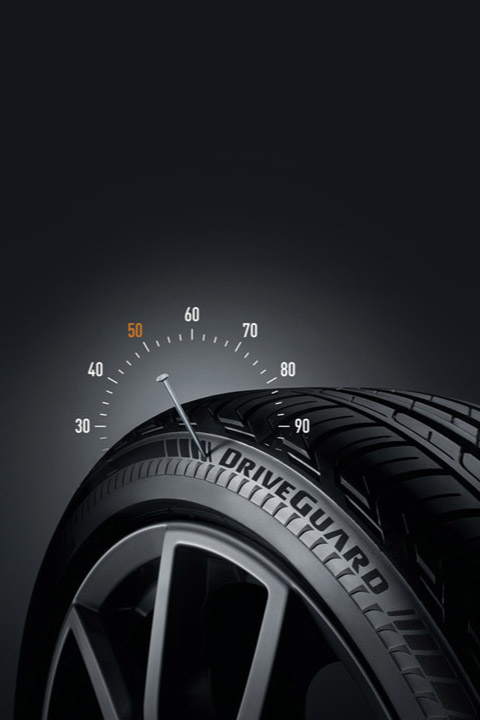 Designed for all passenger cars, the innovative Bridgestone DriveGuard technology allows you to maintain control after a puncture, and safely continue driving for 50 miles at up to 50 mph, until it's safe to either repair or replace your tyre. T001 - NEW PATTERN launched to replace the ER300. Quieter tyre than the ER300 and meets the 2016 noise planned legislation. Superior fuel performance as has lighter weight construction with improved rolling resistance. Improved braking distance in the wet. The Bridgestone RE050A has been designed for the sporty & demanding driver. Run Flat Technology sizes available where applicable. Assymetrical tread design derived from Formula 1 technology for ultimate grip and response whether in the wet or dry. Outstanding grip in the wet. The Bridgestone Dueler All/Terrain 694 has been designed as an all terrain tread pattern with excellent on-road performance especially in the wet. The "Shark Skin" technology reduces flow resistance on groove walls so improving drainage away from the blocks which reduces aquaplaning. The Duravis R660 is a fantastic economical tyre and gives you outstanding mileage, high durability and great performance in wet conditions. The Potenza RE 050 is a perfect tyre for the sporty, demanding driver in wet and dry conditions. This product is suitable for a wide range of models, from super sports cars such as the Enzo Ferrari, to popular models like the new Golf. It offers high performance with a good level of comfort and low noise. In certain sizes it is available as a run flat. Wherever you go, the Dueler A/T 001 is tough enough for whatever lies ahead. Engineered to perform on and off-road, this tyre is ideal for conquering tough terrain in all seasons. Its robust design and resistance to aquaplaning help keep you safe. Racing precision meets superior traction and cornering in Bridgestone's ultra-high performance S001 tyre. Developed for motorsport's premier arena, the Potenza S001 pushes the boundaries of power and control to unleash the full potential of your highperformance vehicle. The brand new Bridgestone T005 is designed for British driving conditions and is available at Bush Tyres! Developed and produced in Europe, Bridgestone Turanza T005 delivers outstanding wet performance and fuel economy, combined with high mileage, to give drivers full control in challenging daily situations, especially on rainy days and we are proud to stock T005 in Bush Tyres stores. Bridgestone Turanza T005 has already been chosen as original fitment by top car brands and so you know your car is in good hands! If you want a tyre that puts you in full control in daily, challenging situations, especially on rainy days, and a tyre that also gives you good fuel efficiency and mileage, the T005 is for you! Turanza T005 offers drivers best-in-class EU label A-grade wet grip and outstanding B-grade rolling resistance. Selected sizes in the line-up provide A/A grade performance. The best-in-class wet lateral grip and wet braking performance has been tested and certified by TÜV SÜD, one of Europe's most respected independent automotive testing institutes. You can purchase your T005 tyres at your local Bush Tyres. The B250 combines the benefits of safety and comfort. The Bridgestone Dueler Highway/terrain 689 has been designed for a quiet comfortable ride with a well-balanced driving performance. Has a wide range of OE approvals. Small block and all-season tread pattern gives great grip in the wet. Bridgestone Europe (BSEU) is a key regional subsidiary of Tokyo-based Bridgestone Corporation, the world's largest manufacturer of tyres and other rubber products. Bridgestone Corporation and its subsidiaries employ over 140,000 people around the world, operate 178 plants in 25 nations and sell products in more than 150 countries. One in five vehicles in the world drives on the company's tyres. "Serving Society with Superior Quality" has been our mission since Shojiro Ishibashi founded Bridgestone in 1931. Founder Shojiro Ishibashi used an English translation of his surname for the name of the company. As Japan's automobile industry grew, The Bridgestone Group expanded its business to become Japan's largest tyre manufacturer. The company also actively expanded overseas, particularly in Asia. In 1988, the company acquired The Firestone Tire & Rubber Company, a well-respected global corporation with a venerable history of its own. This transformed Bridgestone into one of the world's largest tyre and rubber companies and created a global team dedicated to serving customers worldwide with the highest level of quality, service and technology. Often, customers assume getting a good quality tyre will get them through anything, but that’s not true because tyre longevity depends primarily on the type of vehicle you are driving as well as your driving style. If you’re going to be drifting and braking a lot, your tyres are less likely to last long. For advice on your specific circumstances, contact your local Bush Tyres branch to speak to one of our tyre experts. Bridgestone tyres have always been a crowd favourite due to their reliability as well as durability. Contact your local branch to discuss your requirements with our tyre experts. Bridgestone A/T tyres have less-thicker sidewalls than BFG A/T, but they outdo them when it comes to wet tarmac and noise. We suggest you go for the best suited Bridgestone A/T tyres for your vehicle. Contact your local branch for further guidance. You base your decision on a tyre’s load rating which is determined by dividing the total weight of the car by 4 to determine the weight each tyre will bear. C, D and E rate tyres are better for heavy weights which makes Bridgestone e tyres a great choice. Contact your local branch for further advice. No, Bridgestone Potenza tyres do not run flat. Quite often, people make the mistake of delaying tyre repair or replacement because of the misassumption that their tyres would run flat. Contact your local Bush Tyres branch to ask for varieties that may run flat. Do not neglect your tyres, especially if they don’t run flat. Bridgestone offer a variety of mud and snow tyres that will provide great handling in any weather or road conditions. The Dueler A/T 694 tyres in particular come marked with M+S lettering on the side so you know they’re made for rough handling, and good grip. Check out our tyre range for prices and models. If you're looking to ditch the stock tyres on your jeep or similar vehicle, try Bridgestone 4x4 tyres instead. They’re the latest A/T Duelers and they have a lot of grip, so they can plough through pretty much any type of surface quite easily. It all comes down to the vehicle you have and the application you expect from the tires. There are high performance tyres that you can use to drive at top speeds, 4x4 tyres that are great for the off road experience, alongside many other types. Contact your local Bush Tyres branch for advice on the best tyres for your vehicle. Bridgestone Exedra G703 tyres are specially designed for touring motorcycles and suitable for varied conditions. Bridgestone Ex tyres offer just the right durability and safety one needs on tour. Bridgestone D Sport HT tyres have specially designed treads with three wide circumferential grooves to release water from the surface and prevent aquaplaning. The tread around the grooves further breaks down into smaller blocks to improve the grip on wet surface, making them excellent highway performance tyres in all conditions. Bridgestone is a Japanese company. It offers a diverse range of products, with its franchises present across the globe. Bridgestone is a global manufacturer and makes tyres all over the world. Bridgestone tyres are owned by Bridgestone Corporation. It is a Japan-based company and has subsidiaries all over the world, making it the largest global tyre company. You can check out the range of tyres it offers at your local Bush Tyres branch.